Google introduces Android 9 Pie with Adaptive Battery, App Actions, Display cutout, Slices and more. 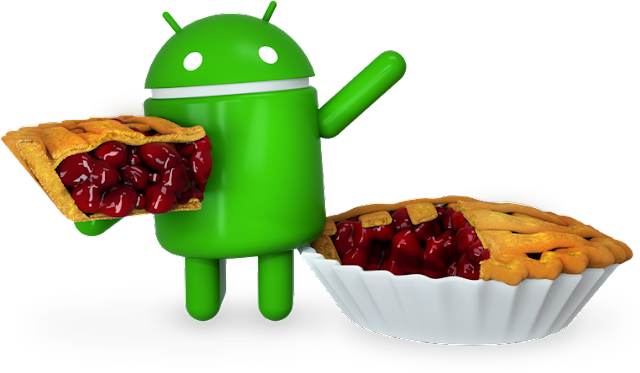 After more than a year of development and months of testing by early adopters, Google today introduces Android 9 Pie, the latest release of Android, to the world. Android 9 aims to make your phone even smarter by learning from you and adapting to your usage patterns. That's why Android 9 comes with features like Adaptive Battery, which learns the apps you use most and prioritizes battery for them, and Adaptive Brightness, which learns how you like to set the brightness in different settings, and does it for you. In Android 9, Google introduced a new system navigation featuring a single home button. This is especially helpful as phones grow taller and it's more difficult to get things done on your phone with one hand. With a single, clean home button, you can swipe up to see a newly designed Overview, the spot where at a glance you have full-screen previews of your recently used apps. Swipe up from anywhere to see full-screen previews of recently used apps and simply tap to jump back into one of them. If you find yourself constantly switching between apps on your Pixel, Google got good news for you: Smart Text Selection (which recognizes the meaning of the text you're selecting and suggests relevant actions) now works on the Overview of your recent apps, making it easier to perform the action you want. You can enable this new system navigation in Settings once you've received your update to Android 9. Android P also brings a redesigned Quick Settings, a better way to take and edit screenshots, simplified volume controls, an easier way to manage notifications and more. At Google I/O in May, Google previewed some of these digital wellbeing features for Android, including a new Dashboard that helps you understand how you're spending time on your device; an App Timer that lets you set time limits on apps and grays out the icon on your home screen when the time is up; the new Do Not Disturb, which silences all the visual interruptions that pop up on your screen; and Wind Down, which switches on Night Light and Do Not Disturb and fades the screen to grayscale before bedtime. In addition to continuously hardening the platform, and an improved security model for biometrics, Android 9 enables industry-leading hardware security capabilities to allow protecting sensitive data like credit card information using a secure, dedicated chip. Android 9 also brings important privacy improvements, such as TLS by default and DNS over TLS to help protect all web communications and keep them private. Now your app can take full advantage of the latest edge-to-edge screens through display cutout support in Android 9. For most apps, supporting display cutout is seamless, with the system managing status bar height to separate your content from the cutout. Starting today, an over-the-air update to Android 9 will begin rolling out to Pixel phones. And devices that participated in the Beta program from Sony Mobile, Xiaomi, HMD Global, Oppo, Vivo, OnePlus and Essential, as well as all qualifying Android One devices, will receive this update by the end of this fall. Google also working with a number of other partners to launch or upgrade devices to Android 9 this year.